These stackable conference chairs stack vertically for space-saving storage. 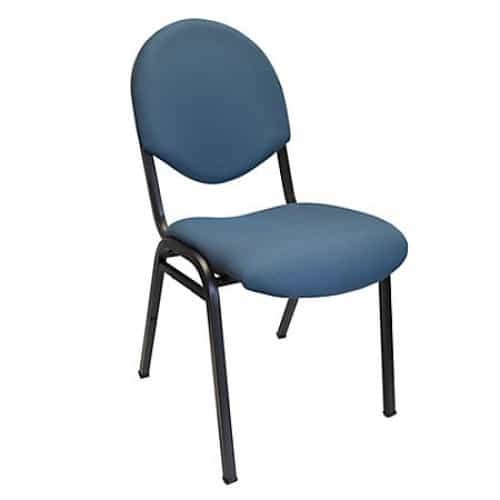 No matter how many chairs you need, this stylish, yet durable chair will blend well for any group gathering occasion. Ergonomic padded seat and back with waterfall front to help reduce stress on your legs. Overall dimensions: 34"H x 18"W x 24 1/4"D.
Thick-gauge, tubular-steel frame is unitized for strength with durable floor guides. Durable powder-coat finish helps ensure the stacking banquet chair looks good over time. Weight capacity tested to 225 lb. Padded seat and back offer comfort and support for your guestsComfortable padding helps your guests ..